De Colores: The Raza Experience in Books for Children: ¡Sí, Se Puede! Yes, We Can! Janitor Strike in L.A.
¡Sí, Se Puede! Yes, We Can! Janitor Strike in L.A. Through the eyes of a janitorial worker’s young son, readers come to know the conditions that united some 8,000 workers in the Justice for Janitors campaign in Los Angeles in April of 2000. Carlitos’ mother is a present-day hero, struggling to support her family. She works nights as a full-time janitor, and cleans houses and takes in laundry on weekends. Still, she is not paid enough to afford the medication that his grandmother needs. Mamá explains to Carlitos that she and the other workers will have to go on strike for higher wages and a better life, including more time to spend with their families. As Mamá tucks her young son into bed, Carlitos wonders how he can help. For Raza children, ¡Sí, Se Puede! Yes, We Can! is a gift, a rare connection with their own families’ lives and struggles. 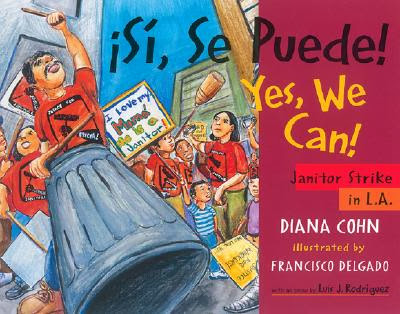 For all children, it’s one of the few picture books that celebrate the power of people uniting for a cause, and that invite discussion of contemporary issues of social justice, of exploitation, of migration and immigration, of the struggle for a living wage, of the need for strong unions, of modern-day heroes, and of women as leaders. Highly recommended. We welcome all thoughtful comments. We will not accept racist, sexist, or otherwise mean-spirited posts. Thank you. Children's Books about César Chávez: Telling or Showing? You are brave. We believe you. We support you. We care about you. César: ¡Sí, Se Puede! Yes, We Can! Esteban de Luna, Baby Rescuer! / Esteban de Luna, ¡rescatador de bebés! ¿Hasta Dónde Me Amas? // How Far Do You Love Me? How Do You Say? / ¿Cómo se dice? ¡Olinguito, de la A a la Z! / Olinguito, from A to Z! One Minute Mysteries: Short Stories You Solve with Math! / Misterios de un minuto: ¡Misterios cortos que resuelves con matemáticas! One Minute Mysteries: More Short Stories You Solve with Science! / Misterios de un minuto: ¡Más misterios cortos que resuelves con ciencias!